Price of carb is back to 1650. I guess we missed the sale at 1500. I met the guy with the carb at Hershey. He was a jerk. I would be afraid that if I bought it, it might be lacking some of the internal parts. 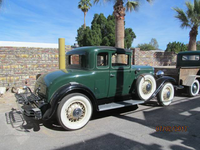 Is this 1931 Reo Royale still available? Car was sold last year. What a wonderful website! This dialog reminds me of a nagging question. Would one post a want ad in the for sale section? ...for those of us either with aspirations of finding the right car (yours truly) or who have found such a car and are in need of certain items. I would say, yes! By all means! By the way, since we are talking about sold cars, the Victoria restoration project in Seattle, Washington, got sold. I don't have the name of the new owner but he is apparently a collector from Colorado. Thanks very much. The Colorado buyer likely did me a favor, as I'd prefer an assembled original or an older restoration that is closer Getting back on the road. Full restorations are usually underwater sorts of adventures. I'm waiting for pictures from Shawn Miller on the Victoria that Brian Coffee is selling. Ed, wasn't there more than one? I don't suppose you took any pictures? Shawn Miller has the advertisement up for the 8-35 Victoria. I will post pictures of it on the victoria thread. A few more pieces of information. There are 2 engines, one of which is coming back from the machine shop rebuilt. There are loads of extra parts which Shawn is going to get a complete list of. I don't want to contradict my good friend A J, but Shawn Miller told me that both of the engines are NOT rebuilt and are in pieces.